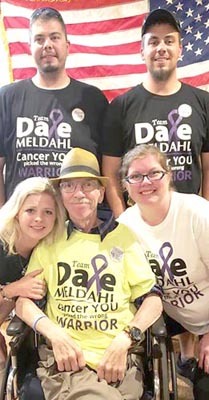 Dale Meldahl is joined at his benefit by, not in any particular order, Tyler Sorensen, Derik Sorensen, Chelsea Van Tassel and Laura Ruchotzke. Dale and Joyce Meldahl smile brightly at the benefit for Dale at the Stewartville American Legion Post 164 and Strikers Corner on Saturday, June 23. Nichole Scolet of Byron sat at a table in the crowded Stewartville American Legion Post 164 on Saturday afternoon, June 23. 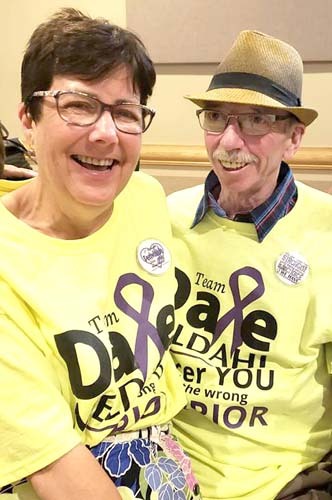 Scolet is one of hundreds of local and area residents who attended the benefit planned for her dad, Dale Meldahl of Racine, who was diagnosed with metastatic gastric stomach cancer last March. "I'm amazed at all the love and support," she said. "It's awesome." Scolet took a short break from selling benefit T-shirts to talk about her dad, who has battled his cancer with chemotherapy treatments and numerous procedures and scans. "He's a wonderful father," she said. "He's always willing to help anybody who needs it. He's got a heart of gold..."
For more on this story pick up your copy of the July 3 Stewartville STAR.